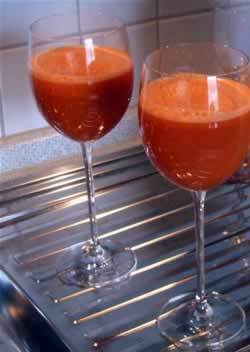 Start off each day with a glass of freshly made all natural carrot juice. Carrots are definitely the staple of natural juicing. Carotenes and carotenoids should be an important part of every one's diet. Plant based beta-carotene is converted naturally by your body into the animal form of vitamin A. Both beta-carotene and vitamin A retinol circulates throughout the human body in your blood. High blood levels of these important nutrients will boost your natural immunity. As a result, there is a constant and never-ending pressure to include plenty of beta-carotene in your healthy whole food diet. 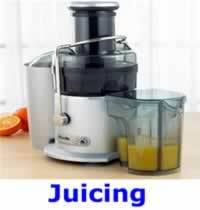 Juicing carrots is simply another easy way to increase the amount of these healthy carrot based nutrients in your diet. First thing you have to do is locate a local grocery store that sells giant carrots in bulk, such as a farmer's market or a Hispanic grocery store. Air dry them, and then store inside a plastic bag closed tightly with a clothespin. Just before you juice your carrots, wash them under running water while scrubbing with a stiff nylon bristled brush. Then peel just the dirty, or discolored, spots on the carrots. Next, cut off a small portion of each end. Be sure to compost all your carrot discards. Don't bother cutting the carrots into sections, lengthwise. Whole carrots are easier to feed through your juicer. A single giant 11 inch long carrot can make as much as 4 fluid ounces (120mL) of fresh pure carrot juice. How much you should drink each morning is entirely up to you. You can save the carrot pulp inside sealed baggies inside your refrigerator, for later use in homemade breads, among other things. Simply line the pulp container of the Breville juicer with a large plastic baggie, before each use. When seeking the health benefits of food and juicing, it is futile to try to quantify the health benefits by individual nutrients. Reportedly, 3.5 ounces, or 100 grams, of raw carrots provides 8.3 mg of beta-carotene, which is a strongly-colored red-orange pigment. Better simply to enjoy the experience of drinking raw carrot juice knowing that what you are getting is 100% natural. It is the position of the Natural Health Perspective that drinking fresh, pure carrot juice goes a long way towards improving your nutrition. All natural nutrient dense juice carries a big punch, inside a small package. Be sure to use moderation in all things, including juicing. Beta-carotene stimulates human leukocytes to secrete a novel cytokine. J Leukoc Biol. 1989 Mar;45(3):255-61.